Ottawa, ON— Independent Jewish Voices Canada (IJV) is shocked and appalled by the news that Israeli police have reportedly shot Palestinian member of the Israeli parliament, Ayman Odeh—who leads the third largest party in the Israeli Knesset—in the head using non-lethal ammunition. 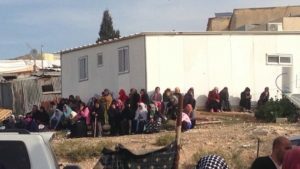 The incident took place during a protest against the state’s impending demolition of the Bedouin village Umm al-Hiran. The attack on Odeh coincided with the fatal shooting of a local resident by Israeli police, and the killing of an Israeli police officer, when Israeli police entered the village to begin demolishing its structures. There are conflicting reports about the nature of these killings. “IJV therefore calls upon the Canadian government to publicly demand that Israel immediately abandon its violent and discriminatory agenda aimed at demolishing the homes and communities of Bedouin citizens of Israel,” concluded Levitan.